Peter Stolyarsky (Pyotr Solomonovich Stoliarsky), was a Russian (Ukrainian) violinist and teacher born on November 18, 1871 (Brahms was 38 years old.) He, like Leopold Auer, Carl Flesch, and Ivan Galamian, is remembered as a pedagogue and not a concertizing soloist. He began his studies with his father then progressed to Stanislaw Barcewicz, Emil Mlynarski (the founder of the Warsaw Philharmonic) in Poland, and Josef Karbulka back in Odessa. He graduated from the Odessa Conservatory in 1893 and went to work almost immediately in the orchestra of the Odessa Opera House where he played for about 26 years. He started teaching privately in 1898 and opened his own music school in 1912 (some sources say 1911), at age 41. From 1919 he taught at the Odessa Conservatory. 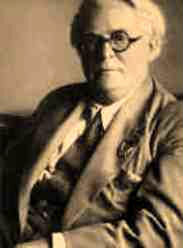 He was instrumental in the opening in Odessa of a music school for gifted children in 1933. His famous pupils include David Oistrakh, Nathan Milstein, Boris Goldstein, Albert Markov, Naoum Blinder, Elizabeth Gilels, Eduard Grach, and Zakhar Bron (himself an eminent teacher.) Stolyarsky died on April 29, 1944, at age 72.